There is no shortage of amazing graphic novels in the world these days... but this one is now on the top of my 2014 list. The Stratford Zoo looks like a normal zoo... until the gates shut at night. That's when the animals come out of their cages to stage elaborate performances of Shakespeare's greatest works. They might not be the most accomplished thespians, but they've got what counts: heart. 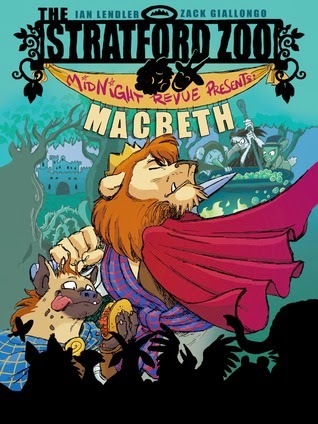 Also fangs, feathers, scales, and tails, in The Stratford Zoo Midnight Revue Presents Macbeth. This may be my favorite graphic novel so far this year. Yes, I've always been a huge Shakespeare fan, but it's more than that. It's the combination of art and words and the fact that it is an effortlessly fun way to introduce this story and rather sophisticated themes to upper elementary students. The pictures are just packed with details and fun little bits that you may not notice until the second or third reading. A poor fox wants to move so he doesn't have to sit next to a skunk. Two rabbits are clearly aggravated at being seated behind the giraffe. The tantalizing scent of temptation glows as it hovers and leads the kingly lion toward the witch's cauldron. The panel design is easy to follow, even for students who are new to comic formatting. Even with that easy style, there are plenty of details to keep the eye from boredom. Inset panels with a different color scheme show what the audience is thinking as the play progresses. Not all pages have just simple rectangular panel shapes. Okay, so it's Macbeth. You know what the plot will be. There is murder and guilt. Temptation and hubris. Greed and punishment. Yet Lendler manages to make it his own with lots of humorous asides that break up the tension. Ketchup substitutes for blood to keep it kid friendly. It's a tragedy, but with an ending that keeps the message but lightens it up for the younger crew. -- Just let them read it because it's awesome. -- Okay, it would also be a great tie in with any novel studies that relate to universal themes like greed, temptation, and punishment. -- Want to do a Shakespeare competition? Using this graphic novel would be a wonderful way to show how to creatively alter a traditional play to make something unique and entertaining. -- With older kids, partner with the Gareth Hinds Romeo & Juliet. Book two will be Romeo and Juliet. Do you think I could plug a request for one of the comedies to follow? Let's get this zoo crew on Midsummer Night's Dream!